Judges' Finalist 2015 ICON Award! 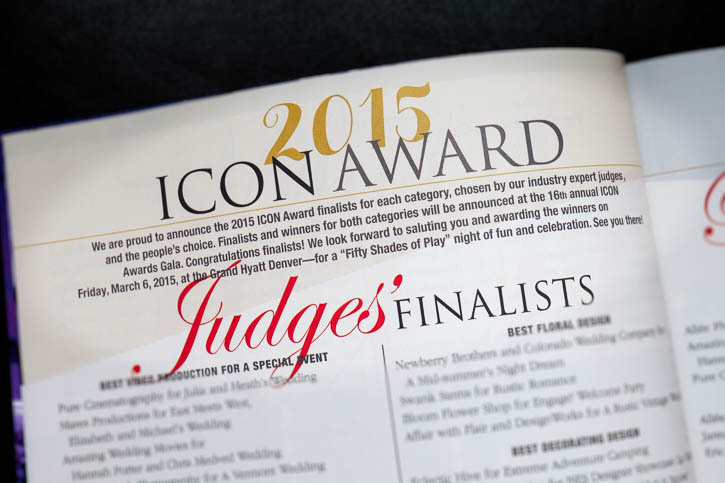 We are thrilled to learn that The Wedding Pink 2014 has been chosen as a judges' finalist for the 2015 ICON award for best social event produced for a nonprofit organization. Huge kudos to our incredible team of vendors: Cloud 9, Crooked Willow Farms, Biscuits & Berries, Van Buren Photography, A Design Resource, Anna Be Bridal Salon, The Makery Cake Company, Erin Ferris Hair, Robin Flanagan Makeup, A Music Plus DJ, All Digital Photo & Video, Allwell Rents, Pink Monkey Solutions, Hipster Mama Productions, Cloud 9 Invitations, Men's Wearhouse - Park Meadows, The Event Booth, Chair Covers and Linens, Hammond's Candies, Hyatt Place Denver South, M Photography, Cheryl Ungar Photography, Todd Reed Jewelry, Chairished Vintage, and Splendor. On top of all that they have our lovely Wedding Pink couple, Erika and Mike, featured on the cover of Confetti 2015. We now have a full gallery of images from Erika and Michael's beautiful wedding on our website. Please take a look and share in the joy of their special day. You may view the gallery here. It’s early July and I am still floating on air from our wedding that took place on May 15 of this year. As I sit here, I reflect on memories of the day and events surrounding it with an ear-to-ear grin. In one word, it was “perfection”. To think that a year ago I had no idea what The Wedding Pink was or who any of the beautiful people that swept so gallantly into my life to give it to me were. I was engaged to a wonderful man, and I had short hair and a new outlook on life thanks to my cancer battle that had taken place the year before. My fiancé Mike, who is from New Zealand, and I did not have the slightest clue as to how to pull off our dream wedding in the wake of my illness and the tumult that accompanies it. We were shelling out almost $800 a month for my health insurance and just trying to get our feet on the ground after a big move from NYC to the Midwest. We knew that above all, we wanted to bring our families together. Between the both of us, we have family members on three continents, spanning multiple countries. How many opportunities, we asked ourselves, would there be to bring everyone together like this over our lifetimes? Not many. But when it came down to it, we could not piece together a proper celebration with the budget we had and the energy we lacked. It became a source of stress and difficulty for us. We were so excited to get married, but completely lacked the resources to accomplish the task. Enter: The Wedding Pink. I was at camp with First Descents (another brilliant cancer organization that does adventure trips for young adult survivors) when one of my camp-mates asked me about my engagement and if I had plans for a wedding yet. “Don’t ask!” I said jokingly, explaining the situation. She asked me if I had ever heard of The Wedding Pink and told me a fellow breast cancer survivor friend of hers had won it last year. We jumped on the computer to check the submission date for the next wedding and it happened to be the week after we returned from camp. From that moment on, everything felt serendipitous. I submitted our story, with its twists and turns and genuine hope that we would be called for an interview. And we were. When we were told that we had won the wedding, I distinctly recall Mike and I hanging up the phone, looking at each other with the widest eyes, falling and laughing on the couch for about 20 minutes straight. “WHAT!! THIS IS AMAZING! !” we could not stop saying. It was. Meeting Cheryl Ungar, the survivor that founded The Wedding Pink, was like meeting an old friend. Cheryl’s heart and soul soar with her work on this wedding giveaway and she does it out of the absolute kindness of her own heart. There is no reward for her except in bringing joy to others and it is a very special person that can offer that to others so selflessly. Her entire team of vendors is of that same ilk. People often assumed when I told them I won a wedding that I had to just fall in line with whatever was decided for me. This could not be farther from the truth. When I met with Ann Marlin of Cloud 9 Weddings and her fabulous team, we were immediately assured that everyone participating in this wanted to give us OUR dream wedding – not a cookie-cutter version of things they decided for us. They asked us our style, got a sense of our personalities, figured out what our likes and dislikes were and did nothing without asking us twice before making decisions. The day was, as I said, perfect. We were married at Crooked Willow Farms, an absolutely stunning location south of Denver. I described it to people as a country chic, which was just excellent for Mike and myself: a little bit rustic, but absolutely upscale and gorgeous. When I walked down the aisle to see my future husband standing there and looked around the room at all of the people that had made the journey to Colorado from literally all over the world, my heart swelled. This was not just about our union, but it was so much more. It was a celebration of life, of love, of family and friends. It was an excuse to have a full day of utter bliss and happiness with no worries. For a cancer survivor, that is the greatest gift. The Wedding Pink is the most remarkable cancer organization I have known, in the sense that it offers something truly unique – it has been said to be a silver lining after a dark cloud and that could not be truer. Winning the wedding in my post-cancer haze could not have offered a better point of focus for me, a point of happy distraction and an opportunity to look FORWARD to something wonderful, rather than dwelling consistently on what had passed. We will always look back on the day with fondness and full hearts. There has been no greater gift to us, besides our health and happiness, that has come our way. The Wedding Pink and the team of vendors behind it are truly, truly special. I have to take a moment to share Erika and Mike's wedding invitation. It turned out so perfect and captures the flavor of their upcoming wedding (which is hard to believe that it is less than 2 months away!). Erika and Mike had the pleasure of working with the multi-talented Ann Marlin of Cloud 9 Weddings & Papers. Ann not only graciously donated the invitations but is also is the lead wedding planner for The Wedding Pink 2014 and 2015. We are very fortunate to have her on board. Happy New Year and thank you to all who have supported us. It has been an exciting year and here are some of the highlights. Our 3rd annual Wedding Pink was held in May at the Wine Country Inn in Palisade, Colorado. Erin and Ben had a beautiful wedding and celebrated with their family and friends. Erika and Michael were selected as the recipients of the 4th annual Wedding Pink which will take place this coming May at Crooked Willow Farms in Larkspur, Colorado. A couple of Erika's friends surprised her at Anna Be Bridal Salon when she was trying on wedding dresses. This is one of my favorite videos of all times. Thank you to All Digital Photo and Video for producing it for us. The Wedding Pink Dress Surprise from Cheryl Ungar on Vimeo. Our lovely bride Erika is dress shopping at Anna Bé Bridal Boutique, who graciously donated a dress, and little does she know that her fiancé, Mike, has arranged for her two best friends to fly into town to surprise her. Huge thank you to Nicole at All Digital Photo and Video for producing this video. Melissa and Jeff, the recipients of the first annual Wedding Pink, brought our first pink baby, Fenn, into the world. We would also like to announce our new advisory board members, Erin & Ben and Ann Marlin of Cloud 9 Weddings. Stay tuned for some exciting announcements coming in January! We have just posted a gallery of engagement photos for Erika and Michael. A few of them are below but you may see a full gallery of images here. Photos by Van Buren Photography and Cheryl Ungar Wedding Photography. All images taken on location at Crooked Willow Farms. This morning, along with Ann Marlin of Cloud 9 Weddings and Patty Moser of Crooked Willow Farms, I had the pleasure of joining Denise Plante on Colorado & Company, Channel 9. We so appreciate Colorado & Company helping further our cause! Last week was a whirlwind trip for Erika and Michael. They were in Denver to begin the journey of planning their wedding. We had wonderful meetings with Cloud 9 Weddings, A Design Resource Florals, Pink Monkey Solutions, Crooked Willow Farms and Biscuits & Berries Catering. Also a fabulous engagement shoot with Van Buren Photography and dress shopping at Anna-Be! You can only imagine the excitement and love that Erika and Michael experienced. Even I am in awe of the generosity of the vendors. Each and everyone is going above and beyond to make Erika and Michael's wedding dreams come true. Here are a few pics from the meetings. Wedding dress photos and video coming soon. Chatting about wedding design ideas with Cloud 9 Weddings, A Design Resource Florals and Pink Monkey Solutions. Touring the spectacular wedding venue site at Crooked Willow Farms. Talking reception menus with Laura at Biscuits & Berries Catering. The talented Katie Van Buren taking engagement photos of Erika and Michael. at Crooked Willow Farms on Thursday, May 15, 2014. We are in the process of assembling an amazing team of vendors including Cloud 9 Weddings, Van Buren Photography, Anna Be Bridal Boutique and A Design Resource Florals. Additional vendor information will be posted as it becomes available so be sure to stay tuned to our blog and facebook page.